Estero Brand Vintage Lemon Crate Label, Goleta Lemon Assn., Goleta, California. Image of schooners anchored in a cove. 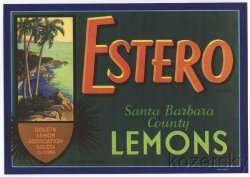 Estero Brand Vintage Lemon Crate Label. Original Estero Santa Barbara County Lemon Crate Label, Goleta Lemon Assn., Goleta, California. This original, mint 1950s label measures 8.75x12.25 inches. Image of schooners anchored in a cove.